Dookie is the third full studio album and the major label debut by American punk rock band Green Day. The album was the band's first collaboration with producer Rob Cavallo. Released on February 1, 1994 through Reprise Records, Dookie became a worldwide commercial success, reaching number two on the U.S. Billboard 200 and charting in seven countries. The album helped to propel Green Day into mainstream popularity, amid claims from the punk rock community that the band had "sold out". 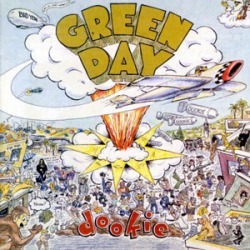 Dookie produced five hit singles for the band: "Longview", the re-recorded "Welcome to Paradise", "Basket Case", the radio-only single "She" and "When I Come Around". As of 2008, Dookie is the band's best-selling album, with over 25 million copies sold worldwide. It is Green Day's only diamond album. Dookie won the Grammy Award for Best Alternative Music Album in 1995. In 2003, Rolling Stone ranked Dookie at 193 on the list of the 500 Greatest Albums of All Time.